Must see home on golf course w/owner's suite on main level! Potential 5 bedroom/3.5 bath! Open entry way w/tons of natural light & hardwoods on main. All new paint & light fixtures throughout! Office/flex space w/extra closet space & large windows. Separate dining room for formal gatherings. Open floor plan, great room w/cozy stone gas logs fireplace. 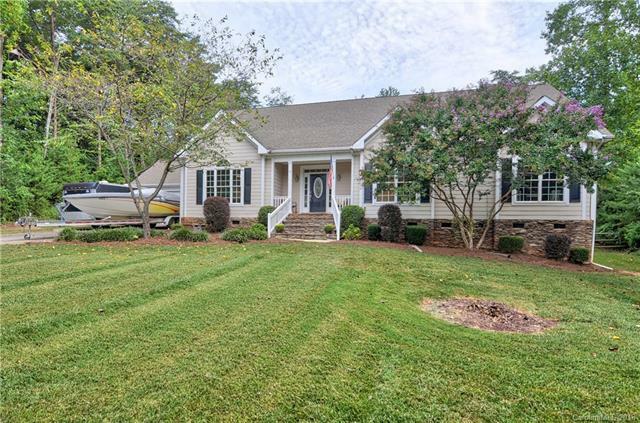 Eat-in kitchen w/upgraded granite counter tops, tile back splash & ss appliances, center peninsula & breakfast area w/sliding door access to back deck. Elegant first floor owners retreat w/walk-in closet & separate backyard access w/relaxing deck . Connecting en-suite w/dual vanity, separate soaking tub/tile shower. Spacious secondary bedrooms & bonus room/loft upstairs w/guest bath! Fenced in peaceful & private backyard surrounded by mature trees, perfect for grilling & entertaining! Great location, close to marina/boat launch, schools/restaurants & shopping! Private road in process of signing paperwork to become publicly maintained.